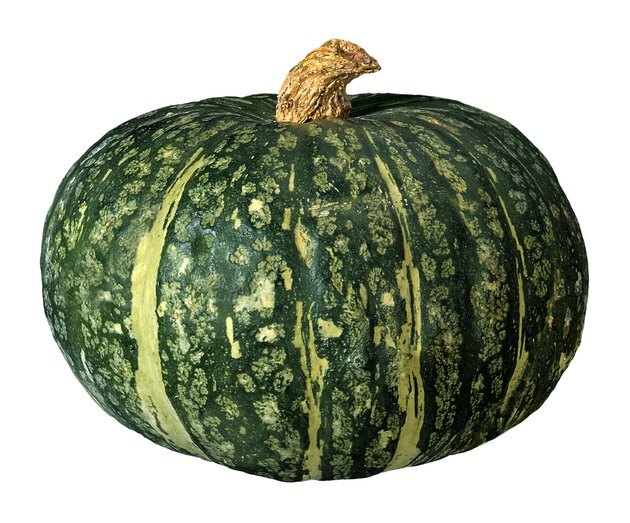 Kabocha squash, also known as Japanese pumpkin or Japanese squash, is a winter squash with a tough, dark-green or bright orange outer covering, depending on the variety. The fine-textured, golden flesh tastes somewhat like pumpkin or sweet potato. Like other winter squash such as butternut or acorn, kabocha is rich in nutrients, including fiber, beta carotene and potassium. Baking is a simple and nutritious way to cook this flavorful squash. Eat the baked squash as is, or use it in pies, soups, or other main dishes. Select kabocha squash with a hard rind and a firm stem. Avoid soft squash, which may not be ripe, and mushy, bruised squash, which probably is too old. Scrub the kabocha squash with a stiff vegetable brush while holding the squash under cool, running water. Cut the kabocha squash in half, using a sturdy knife. Remove the seeds and fiber, and then cut the squash in serving-size chunks. Place the squash in a roasting pan with the cut side up. Brush the squash with oil or melted butter. Bake the squash for 20 to 30 minutes, or until the squash is light golden brown. Serve the squash as is, or add about 2 teaspoons of brown sugar, 1/2 teaspoons of cinnamon and a dash of nutmeg or ginger to the top of each chunk. Alternatively, sprinkle each chunk with about 1 tablespoon of grated Parmesan cheese. Kabocha squash also can be baked whole. Pierce the squash several times with a fork or paring knife, and then place the pan in a roasting pan with about 1/2 inch of water. Place the pan on the center rack of your oven, and then bake the squash at 400 degrees F until the squash is fork-tender.